On Tuesday, rock star Jon Bon Jovi helped cut the ribbon on a 55-unit housing development for formerly homeless and low-income residents in Philadelphia, the Associated Press reports. 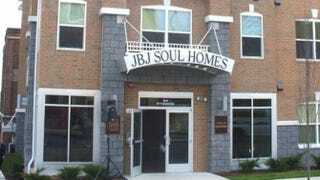 After some 18 months of construction, JBJ Soul Homes opened in the Francisville neighborhood. The four-story building also will include retail and office space. Bon Jovi's Soul Foundation provided the bulk of the money for the $16.6 million project, with other funding from public and private sources. The singer hopes that the new housing development will offer residents the support they need to get back on their feet, AP reports. "This is not a handout, it's just a hand up," Bon Jovi told AP before the official ceremony. "This opportunity for them is special and it's not easy to come by." Project HOME, a nonprofit dedicated to ending homelessness in Philadelphia, has partnered with JBJ Soul Homes to provide social services to residents. Residents of JBJ Soul Homes will be required to contribute a portion of their income toward rent but will have access to basic medical care, employment training and educational classes. Several of the units will be used to help young adults transition out of programs for homeless teens. "I'm getting myself back together, and this is a big, big step," new resident Anthony Gulley, 53, told AP. "When they give you the help, you have to be willing to do what they ask you to do. It's beautiful."